When coal-mine bosses said mules were more precious than men because dead miners could be replaced for free, but not dead mules, it demonstrated disrespect. That contempt from the top provoked pitched gun battles between workers and mine-owner militias in West Virginia a little over a century ago. Ill-paid, mistreated and insulted, what did the miners have to lose? The same was true for sanitation workers in Memphis, Tenn., half a century later. Subjected to dangerous equipment that killed four workers in four years and paid so little they qualified for food stamps, more than 1,300 walked off the job on Feb. 12, 1968. They demanded respect, carrying signs stating, “I am a man.” The day after Dr. Martin Luther King marched to support these workers, he was assassinated in Memphis. Now, a half century later, GOP politicians have so denigrated public school teachers that the educators in three states have engaged in wildcat strikes, mobbing their capitol buildings and demanding improved school funding for students and better pay and benefits for themselves and other workers. Teachers in West Virginia, Oklahoma and Kentucky, like the 1920s West Virginia coal miners, had nothing to lose. Educators in Arizona, who began demonstrating at their capitol last week, may walk out soon as well. What these states have in common is Republican control and union suppression. All are states that forbid labor organizations from charging workers who choose not to join the union fair share payments to cover the costs of collective bargaining. This, of course, weakens unions, which are required by federal law to represent workers who don’t join and don’t contribute. Some states, like West Virginia, go even further, outlawing teacher strikes. The U.S. Supreme Court is deliberating a case, Janus vs. AFSCME, that is likely to end with a decision prohibiting collection of fair-share fees by every public sector union in the country. That will weaken all of them. In the end, such a decision from the Supreme Court may inflame more labor unrest and wildcat strikes. The 1935 National Labor Relations Act, passed by a Democratic-controlled Congress and signed by a Democratic President, was intended to facilitate labor organizing because lawmakers believed that would reduce strikes and increase labor peace. Republicans have worked every day since then to weaken the law, with the Janus case just the latest iteration. By undermining organized labor and empowering employers, Republicans have incited labor strife. Parents, communities and educators in West Virginia, Oklahoma, Kentucky and Arizona know that tax-cutting, labor-hating Republican politicians are to blame for the school disruptions. Of course, teachers don’t live in mine company-owned shacks or get paid in company script that can be used only in company stores. But for 2018, the conditions in which these educators find themselves are deplorable. These are professionals with four-year college degrees and teaching certifications. They adore their students, as illustrated by Marjory Stoneman Douglas High School geography teacher Scott Beigel, 35, who opened the door of his classroom to get a group of students to safety during the mass shooting there Feb. 14, but then was shot to death as he attempted to relock the door. Teachers work nights and weekends to grade papers and write lesson plans. They sew costumes for student performances, drive youngsters to competitions, meet with concerned parents. These four states are among the lowest-paying in the nation. West Virginia was 45th when it granted striking teachers a 5 percent raise in February. Oklahoma is dead last. These teachers struggle to meet their college loan obligations, make car payments and cover the mortgage. Teachers in Oklahoma, who haven’t had a pay increase in a decade, often hold two, even three jobs to make ends meet. They sell their plasma, eat in soup kitchens and shop at food banks. Teachers’ low pay qualifies their children for state subsidized health insurance. Teachers in these states are supported by superintendents, school boards, parents and students, who have rallied with them at their capitols. 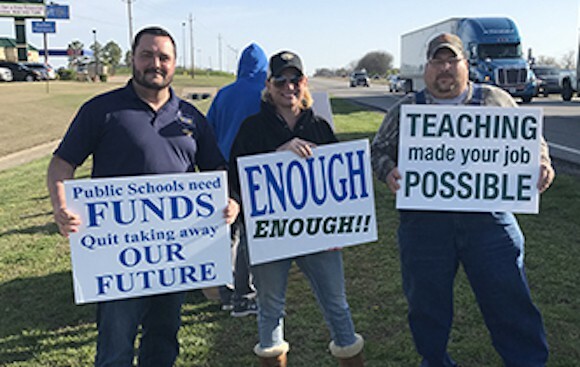 Members of my union, the United Steelworkers, joined teachers protesting in Oklahoma. Superintendents talk about how impossible it is to attract and retain qualified teachers willing to work for the paltry pay in these states. They fill openings with people not trained as teachers holding emergency certifications. They tell of constant turnover. The revolving door disrupts education. Tulsa loses about a quarter of its teachers, about 500, every year, partly because they can earn $20,000 more annually next door in Texas. Oklahoma’s 2016 teacher of the year Shawn Sheehan and his wife, also a teacher, moved to Texas. “Our teachers in Oklahoma are going above and beyond every single day for an unacceptable and unsustainable salary that doesn’t even provide them with a living wage,” Tulsa Superintendent Deborah Gist told the New York Times. Still, many teachers use their own money to buy school supplies because state legislatures have cut education spending year after year while giving businesses and the rich tax cuts. Kentucky is among them, slashing education by $250 million since 2008 while handing out tax breaks to the wealthy. Arizona, Oklahoma and Kentucky boast that they spend among the lowest amount per pupil in the country. Some Oklahoma teachers find themselves in buildings so cold that students must wear coats to class. In some schools, not all lights are turned on. Twenty percent of Oklahoma schools operate on a four-day week to cut costs. Courses like advanced languages and debate are slashed. Paper is rationed in some districts. Some textbooks are decades old or in such short supply students must share them. The Republican governor of West Virginia, Jim Justice, admitted during that nine-day teachers’ strike that he had not looked at education as an investment. That says exactly what teachers and children there need to know about how dimly he views them. At one point during the West Virginia strike, state officials threatened to take legal action against the teachers. Still, the teachers didn’t back down. That sentiment is echoed by educators in Kentucky and Arizona. The teachers in these states are so disrespected that they’ve got nothing to lose, like those West Virginia miners and Tennessee sanitation workers.